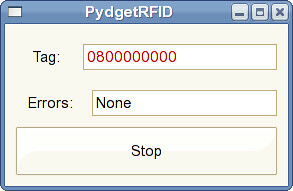 I just released version 0.1 of PydgetRFID, the Python interface to the Phidgets Inc. RFID kit I blogged about earlier. It’s free software (licensed under the GPL). It wraps libphidgets with ctypes to talk to the hardware. The software is now more polished and additionally provides a D-Bus service that allows other applications (written in any language with D-Bus bindings) to use the hardware. 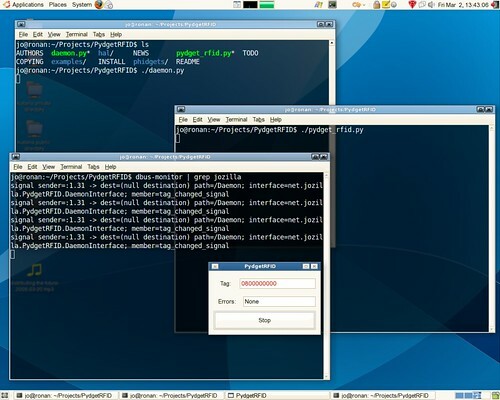 Currently this means you can connect to the hardware from Python, Ruby, .NET, C, C++, Perl and Pascal! More information can be found at the PydgetRFID homepage. I had some fun writing a Python wrapper around libphidgets for an RFID reader we had lying around here. To do so, I used ctypes (apparantly the Python bindings for libphidgets were broken). To check for a connected RFID reader, I interfaced with hal through dbus. Afterwards I created a simple GUI for the device with PyGTK. I experienced some weird permissions problems though. The device could only be opened with root privileges. Takis helped me step through libphidgets to see if there was a bug in it. In the end, we solved it by changing the /etc/udev/rules.d/permissions.rules file (in my case it was called 40-permissions.rules). I’m not sure if there are any security problems with this though. # USB devices (usbfs replacement) SUBSYSTEM=="usb_device", MODE="0664"
# USB devices (usbfs replacement) SUBSYSTEM=="usb_device", GROUP="plugdev", MODE="0664"
I will probably put the code online when I have some spare time (and after I cleaned it up a bit).